A passenger train cannot be made to look inelegant. They beckon us towards discovery, to elegance, to all of the epiphanies that one collects in the process of a journey. They remind us of a time when travel was dignified, effortless, untroubled by the frustrations and delay that taint the process of getting from place to place in modern times. Retired passenger equipment never looses this power, no matter how long it has been left to fallow on a siding, or how many iterations of motive power have passed it by on adjacent mainlines. The Union Pacific Company Special is one of the most colorful and least seen cross-country passenger trains operating in the United States today. In this picture, the train deadheads past Argyle, Texas, after traveling to a board meeting in San Antonio. It is heading northwards to Council Bluffs, Iowa. While listening in on the scanner, we heard the crew of the Company Special mention that they had "just passed the locomotive." They referred to this E9 on static display in Keller, Texas. It is strange that a locomotive originally purchased by the Chicago, Burlington & Quincy should end up on display by Union Pacific tracks with a Texas & Pacific pedigree, but the engine's presence brings a touch of grace to downtown Keller. 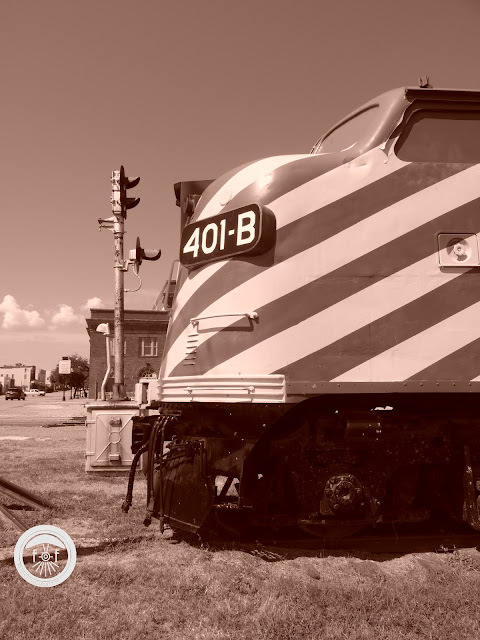 Streamlined diesels are a pleasant deviation from the normal function-dictates-form design of most railroad equipment: It reflects a time when railroading was at its most untroubled, at its zenith of functionality and efficiency, uninhibited in its grandeur. Visionaries in this era could foresee that other methods of transportation would bring traumatic change to the railroad industry, but before it actually arrived, equipment designers took the liberty of indulging in beauty. 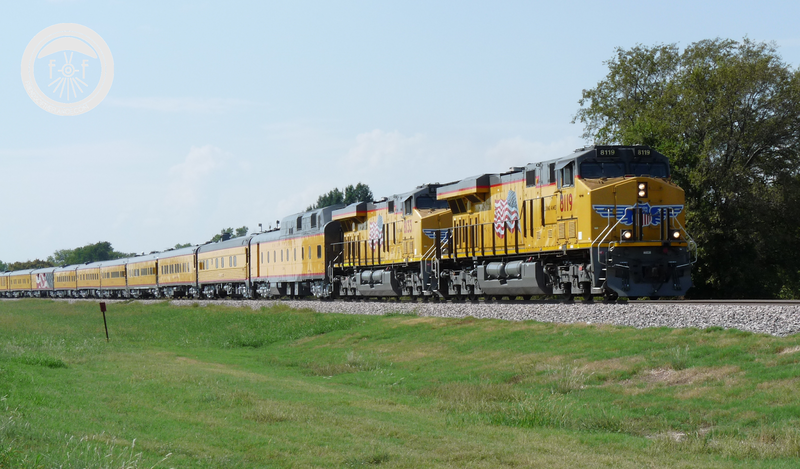 Another fifty miles or so will put the Union Pacific train in Denison, Texas, where another relic of this era makes its home. This ex-MKT F3-unit sits in quiet vigil near the Oklahoma border, waiting on a signal that will never show green. The cab windows have been painted over--as symbolic and as absolute a way of showing that its days of liveliness are over as the act of placing coins over the eyes of a departed person. Its curators at the Red River Railroad Museum have not tolerated a single blemish to its brilliant Katy colors, though, and it is the proudest monument in a town that still shows many signs of its railroad heritage. The housings for a dozen or so telegraph wires once strung up on this pole evidence that Denison was once an important division point along the MKT line. It also emphasizes that railroads are also a form of information technology: For the first time in history, messages could move faster than man or animals could travel, especially when railroad companies began to incorporate telegraphs into their operations and installed poles next to the tracks as a matter of practice. 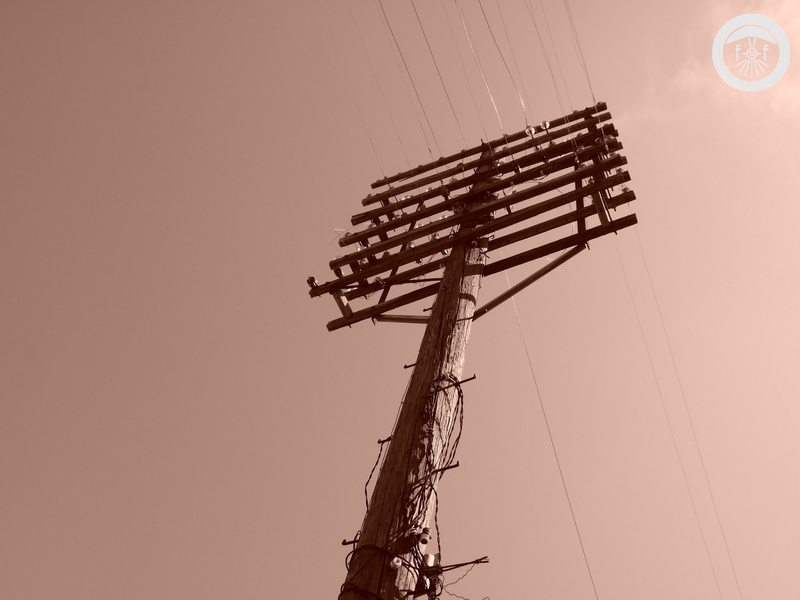 We have since moved on to better and faster methods of communication, but fragments of the old telegraph system still stand shadow the streets of Denison and parallel many still-used mainline tracks. Further eastwards, the ex-Texas & Pacific in Bonham is looking worse for the wear: The Fannin County Historical Museum that makes its home here seems to focus its efforts on the displays within the building. The tracks are no longer in active service, and the station feels far too large for a town that currently only has about 10,000. Bonham is a very quiet town: I had to strain to hear traffic and industrial noise.. On some subconscious level, all of the residents seem to be listening for a whistle, for a sign that the trains and the town's glory are returning.